LUCY BURDETTE: We're delighted to welcome Greg Herren to JRW today. As readers and writers, you will appreciate what he has to say! When I was eleven years old, my parents allowed me to join the Mystery Guild as a birthday present. They’d noticed I wasn’t really reading the mystery series for kids I’d been addicted to for the past three years, and saw this as an excellent way to transition me into reading mysteries for adults. I remember getting four three-in-ones for my penny plus shipping and handling: Ngaio Marsh, Charlotte Armstrong, Agatha Christie, and Erle Stanley Gardner. When the books arrived, the catalogue with the next month’s choices came in the box. The featured selection surprised me; I’d known Phyllis A. Whitney wrote mysteries for teens, but I hadn’t known she wrote them for adults as well. Having enjoyed her work, I went ahead and ordered the book, Listen for the Whisperer. When it arrived, I couldn’t wait to read it. It was a Saturday, and I just climbed back into my bed with a bag of BBQ Fritos, and shut the bedroom door. I took the book with me to dinner, and went right back to bed with it after eating. I was captivated by the story of young reporter Leigh Hollins, going off to Norway to confront the birth mother she’d never known. As a kid who loved to read and was also fascinated by Hollywood, the fact that Leigh’s deceased father had been an international bestselling writer and the mother—Laura Worth—an Academy Award winning actress, made the book all the more involving for me. After refusing to marry Leigh’s father and dumping their child on him, Laura went on with her career—until the filming of The Whisperer. Fighting on the set every day with the director, Cass Alroy—Laura was the number one suspect when he was murdered. She was never charged with the crime, but she fled Hollywood and lived in Norway as a recluse ever since. Leigh’s trip to Norway, ostensibly to do an interview with the former star for a book of actress profiles she is doing, triggers a series of events with their roots on that studio sound stage twenty years earlier, the night Cass Alroy was murdered. As Leigh struggles to come to terms with her complicated feelings for the mother who abandoned her, she also finds her own life in danger. There was also a bit of romance in there, too—enough to get the book labeled as a romantic suspense novel rather than a mystery. I went on to read Ms. Whitney’s entire backlist—Seven Tears for Apollo, Columbella, Hunter’s Green, The Winter People—and also bought her new releases when they were released in paperback: Snowfire, The Turquoise Mask, Spindrift, The Golden Unicorn, and so on. I eventually moved on from Ms. Whitney in the 1980’s, as I discovered new women mystery writers like Sue Grafton, Sara Paretsky, Julie Smith, and Marcia Muller. But I never forgot the hours of pleasure I found in the pages of Ms. Whitney’s books. I wrote Ms. Whitney a fan letter after finishing The Turquoise Mask. I sent it to her in care of her publisher. I’d never written a fan letter before (or since, really), but I told her how much I enjoyed her books and that I aspired to be a writer someday. Two weeks later, I received a typewritten personal letter from Ms. Whitney. It was three pages long, and while the first paragraph thanked me for my letter and my kind words about her own work, the rest of the letter was encouragement for me to pursue my dream, and advice about writing. I kept that letter from 1976 until it was damaged in Hurricane Katrina; I’d always intended to scan it so I could keep it forever. It meant a lot to me as a young aspiring writer, and many times, when I got down on myself or wanted to give up, all I had to do was pull out the yellowed, much-handled letter from a very kind writer who took the time to encourage a fifteen year old she’d never met—or would ever meet. So, thank you, Ms. Whitney, not only for the great kindness in writing me back and encouraging me to chase my dreams, but for the many hours of pleasure I got from your novels, and for writing about strong, independent women in a time when that wasn’t really the norm. 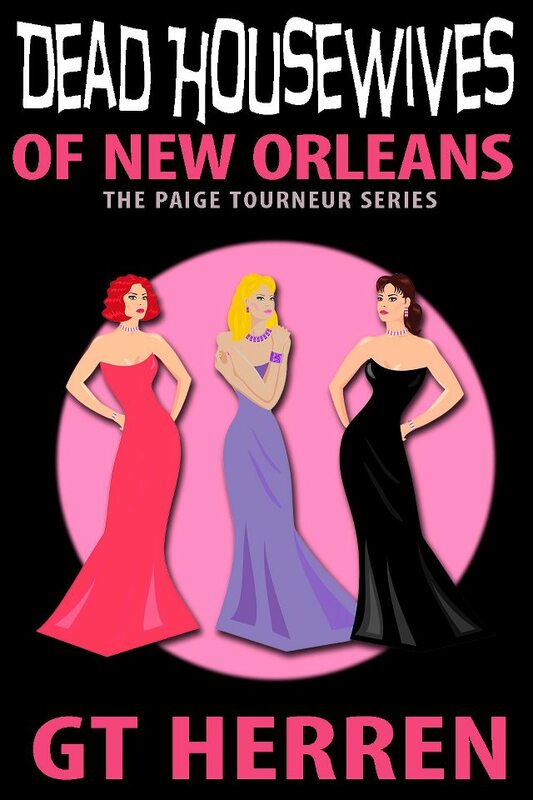 GREG HERREN is an award winning New Orleans mystery writer. 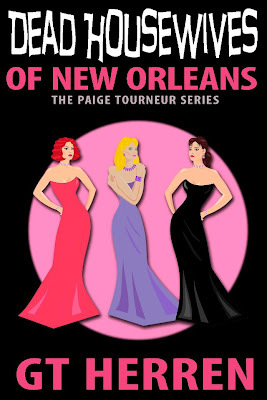 His next novel, “Dead Housewives of New Orleans,” will be an ebook exclusive and will be available soon. He can be found on-line at his website; on Facebook, and on his blog. LUCY: Thank you Greg for the wonderful post today! Reds, did you have someone in your life who inspired you and encouraged your dreams? It’s wonderful to hear about someone who takes the time to encourage a young person to follow his or her dream . . . and exciting to know that the dream became a reality . . . . Congratulations! Oh wow - I love everything about this story so much. I love that you wrote to someone you admire (someone who is an icon to many of us, no less), and that you received such a treasure of a letter in response. That she wrote such a nice letter encouraging you to follow your dream only moves this woman one more rung up the ladder of pure class in my book. I have two very short notes from Harper Lee which I'm going to scan TODAY because of this blog. I would be heartbroken should something happen to them. I did receive some emails of encouragement while I was writing "Whimsey." And they mean all the world to me. Two of them were from Jungle Reds - Hank and Debs - I will hold those notes in my heart forever. Kind words mean more than a lot of people realize, I think. Thanks you, Greg, for a lovely start to my day. I appreciate so much you sharing your story. What a great story. Ngaio Marsh is my idol, but I read a bunch of Phyllis Whitney too. How very gracious, and generous, of her to send you that letter! When my son was in fifth grade, he wrote to JK Rowling. She answered. That baby's in the bank vault. What a wonderful story. I can certainly see how this support in the early stages of writing would be just the encouragement a writer needs. As a reader, it is my interactions with authors that mean the most to me. I am constantly in awe of what you all are able to do with words. I remember reading Phyllis A. Whitney as a boy as well. Along with Victoria Holt, Agatha Christie and Jackie Collins (but that's another story). I can still remember one of my first signing events (maybe the very first). Mary Higgins Clark. She couldn't have been nicer. I'm not sure what I expected, but it far exceeded those expectations. And it was a pleasure to see her again years later at last year's Bouchercon. Thanks for sharing that with us Greg. A wonderful story. And a man who writes cozies or at least a female protagonist? That's cool, too. I wonder how I missed Phyllis Whitney in my early mystery reading. Wow Harper Lee and JK Rowling--those are treasures! I have a note somewhere from Tom Perrotta. Got to find that and put it somewhere safe. And an email from Harlan Coben, essentially saying quit farting around and just write the damn book. And also some wonderful letters from fans after my first golf mystery--oh those mean so much! Kind gestures mean so much, don't they? 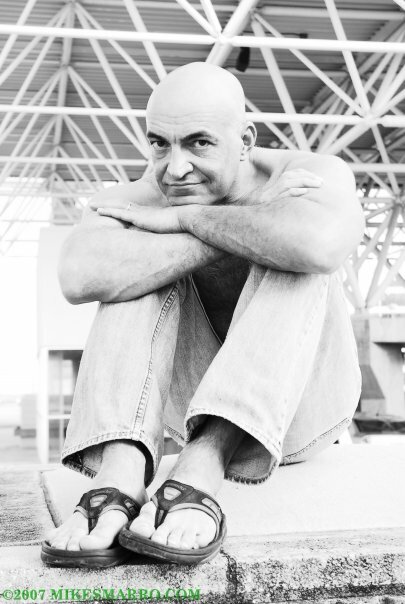 I was an adult when I read Dr. Wayne Dyer's Your Erroneous Zones, and had one chapter turn my life upside down. The very idea that I was the only one responsible for my own actions and fate was so amazing to me. No one else was to blame, and there was no real reason to blame anyone else; I got to choose how to react to every single situation. Then I saw a magazine article about him and his next book, so I wrote to him, wishing him luck with the new book, and thanking him for what he'd written. A couple weeks later there was a thick package from him: a letter thanking me for my letter, and tons of articles he thought might be of interest, and a slim science fiction book he'd written. The book was a little crazy and woo-woo, but I was astonished to get the personal response and all the goodies. I think that was also 1976-77, somewhere in that time period. Wonder where I put that letter? Welcome, Greg. I too loved Phyllis Whitney. In fact I lament the demise of her books, and Mary Stewart's, and Victoria Holt's--atmosphere, danger, romance and exotic settings. My kind of heaven. Oh, what a lovely story! And refreshing to hear a man admit he loved those books as a boy, and was so influenced by them. Hi Greg! What a great post! I loved Phyllis Whitney, too, and like Rhys, Mary Stuart and Victoria Holt. I don't remember the Whitneys as well, but I could probably recount the plot of every single Mary Stuart, even now. I, too, had a subscription to Mystery Guild, and I can remember the thrill of getting that monthly catalogue. AND I read my books eating Fritos in bed:-) Fortunately those days are long gone! Deb, don't feel guilty. The reason we cherish the few letters we all get is because they are so rare. So those to whom you have written will find even more meaning in your attention. OH, that's such a wonderful story! And I missed Phyllis Whitney ,too.. Greg, what would I think if I read her books now? Hi, Greg! Lovely appreciation of Phyllis Whitney. I loved her books. And she wrote an article that was published in The Writer, called "A Map Is Not a Journey," that was a lifesaver to me when I first tried to organize and write a novel. When I was 14, I wrote a fan letter to Colin Wilson, a British writer who'd just become famous for writing a tome on existentialism called THE OUTSIDER. He wrote me back airmail, which was expensive in those days, and was so kind to a young girl who wanted to write. These things mean so very much. Incidentally, for those of you who read the bad boys post, I've put up a poem, "Coyote in Black Leather," on my blog. Wow, everyone! Thanks for all the comments! Hank, the Whitney novels are a little bit dated now, but they still are fun to read; at least to me. "Hunter's Green" has one of my favorite openers of all time: "I have no past, I have no future. All I have is the immediate present." Victoria Holt and Mary Stewart were HUGE favorites of mine as well--I reread "Airs Above the Ground" every few years; it has a great opening as well. And "The Ivy Tree"...sigh. I recently started rereading Victoria Holt, whom I haven't read in decades...I recently reread "The Secret Woman" and "Menfreya in the Morning"--both held up, I thought. I have to say, I have been very blessed in my writing career--Julie Smith has been one of my biggest cheerleaders, and I have had so MUCH support over the years...I try to answer every email or letter I get from a reader, and I always encourage new writers; I feel like I have an enormous debt to repay everyone. And thank you all for being so kind!!! Those of you who've read Phyllis Whitney--which was your favorite? Your favorite Mary Stewart or Victoria Holt? Kaye Barley, I always wanted to meet her in person so I could thank her for that lovely letter, and for taking the time out of her day--she was New York Times bestseller--to encourage a fifteen year old. Kristopher--I read Jackie Collins too--along with Sidney Sheldon, Harold Robbins, Judith Krantz, and Shirley Conran! I was a voracious reader--still am, when I have the time! We had a few comments about Shirley Conran's Savages a few months back here on JWR. Still love that book for the number of strong female characters represented. And yes, I read all those others as well. Not sure what my folks were thinking letting me read those books at the time, but I guess they were just happy I was reading. Since they are not big readers, they didn't know what I was learning. LOL. But I turned out alright, no harm done. Kristopher: LOL, my parents let me read just about anything, really--which is surprising, given how Christian they are. I read "The Godfather" and "Gone with the Wind" when I was ten, and I like to think I turned out okay! Thank you, Edith! So glad you were able to follow your dream, too! Look forward to reading your books! I have never understood why romantic suspense tapered off...whether it was because the big names in the field stopped writing them, or if interest in the books just died away. I wrote an homage to Rebecca which was published last year, Timothy, which people seemed to like...and I've signed a contract to write another one next year. Here's hoping romantic suspense comes back! You'll be at Malice this weekend? Thanks! I don't know, I guess I always liked women writers and women main characters...I always preferred Nancy Drew and Trixie Belden to the Hardy Boys! Deb: I have to admit I've never read My Brother Michael; it's the only Mary Stewart I haven't read--but I recently got a copy and hope to rectify it soon! We're so glad you visited here today Greg--it's a wonderful and inspiring post. Tell us a little more about Timothy. What exactly constitutes an homage to Rebecca? Why, thank you for asking, Lucy! Basically, what I did with "Timothy" was take the basic story of "rebecca", update it, and change the gender and sexuality of the characters; instead of a young woman, the story is told from the point of view of a young gay man who is swept off his feet by a much older, wealthy man whose previous partner was an underwear model. I changed the plot, of course; primarily the main idea was to try to capture that same bleak, hopeless feel from the perspective of a gay men. The story is different, but it's basically the same set up. And thanks for having me as a guest. I greatly enjoyed it! I belong to the Mystery Guild and have for many years. I remember seeing ads for it in mystery magazines and always wanted to join. I finally did when I was in college and had a part-time job so I could afford to buy the books. I love when the catalog arrives. I have some Phyllis Whitney books; most of them are in Reader's Digest condensed books. The one I remember the best is Silversword, set in Hawaii. Actually, I didn't read it, but I skimmed through it. Mary Stewart, I was going to mention her before I got to the comments where she was mentioned. I did read the condensed version of Airs Above the Ground a while ago and really enjoyed it (and the pictures in the Reader's Digest version). I remember it was set in Europe and there was something about the Lippizaner stallions and the Spanish Riding School. I actually saw the horses when they came here to Toledo for a show. Haven't read any other Mary Stewart books but I do have some. I've also read Ngaio Marsh. There are two Inspector Alleyn DVD sets (each has four movies). I enjoy them. I love classic mysteries such as Agatha Christie, etc. I think romantic suspense is still around, but is more closely linked to romance books. Mary Barton is one recent author I can think of.